SoftKB conducting final testing of mobile commerce (Van Selling), and distribution TCUMobile. system is operated on a wholesale frozen products. In the near future, will launch TCUMobile the large distribution system. A few words about TCUMobile. One of the objectives, which sought in the development of the program - the maximum ease of interface. Qualifying employees may differ in orders, the time to train new staff should be minimal. paragraphs describe the main menu. 1. «Sales» used in trade with wheels (Van Selling) to extract spending bills of goods sold. 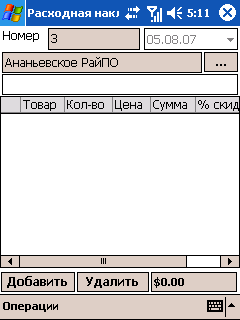 When you click on the button «Sell» expenses will open a new bill. «...» button to select a buyer from the directory clients. Click. Clients grouped by first letter. When you click on the «+» Group disclosed. The red lines are the debtors. 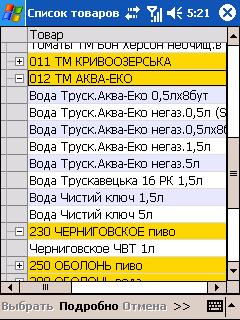 The blue color corresponds to the clients with a positive balance (for example, made an advance). Customers with a zero balance is not painted. Select the client and on the button «Details» (or double-click style) will open the card. Table of settlements contain the details of cash and cash transactions with the selected client. 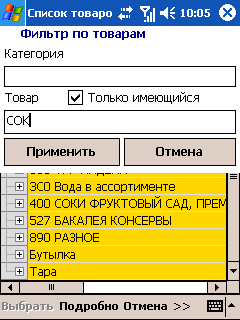 To select the client in the expenditure invoice, simply click the menu item «Choose» at the bottom of the screen. The customer selected. Now you must enter the invoice in the goods sold. Click on the button «Add». 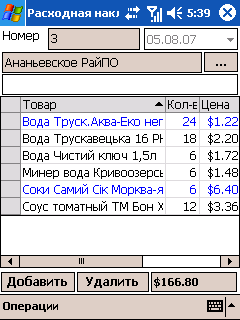 Shops are divided into three groups, when you click on the «+» Group expands to select goods. Choose a product and click «Details». blue highlighted items at a discount. In the bottom of the form shows the amount of the invoice. To delete a position serves as the button «Delete». 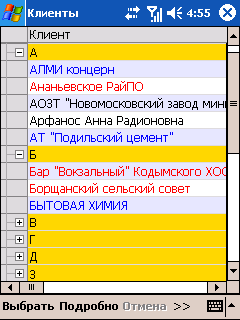 When finished goods entering the menu «Operation» click «Conduct». Following the approval of the invoice can be printed. 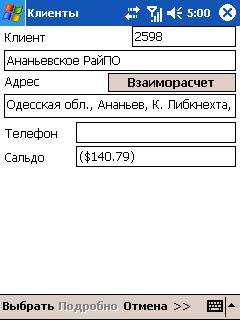 You can also automatically create a document of payment.
. main menu «payment» to enter payments from customers. 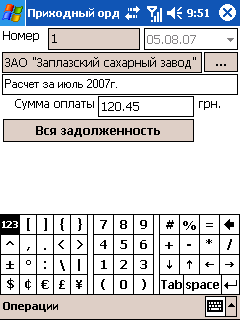 Click on the button «Payment». Select the payer and enter the amount. 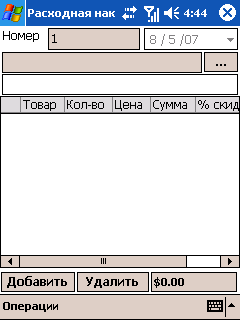 In the menu «Operation» click «Conduct». 4. All your documents, we can see when you click on the button «View Documents». All of the documents can be opened for viewing. If the document has not yet been approved, you can edit. Delete the document may be choosing the same menu item. 6. Menu item «Settings» allows you to adjust the reference documents in real time on the FTP-server. Office program processor takes the data and import them into the accounting system. Your PDA can be connected to a mobile phone with BlueTooth. 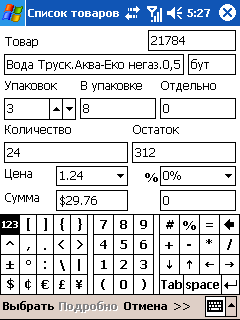 The cost of sending a document to Kyivstar is about 4 pennies.